Is it hard for you to stay focussed on practicing for regional and all-state auditions? Not sure how to practice? Does your low register need some help? This 8-week comprehensive course will walk you through, step by step, scale by scale, the materials for the Kansas regional and all-state auditions for 2019. 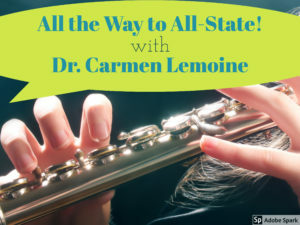 Dr. Carmen Lemoine, flute professor at Wichita State University, former All-Stater, and audition winner, provides the tools and tips for you to succeed at the auditions this year. All fees paid go directly to the WSU FluteShox flute studio to help pay for guest artists and music-related activities. Follow this link to sign up and make a secure payment for the course. Once Dr. Lemoine receives your enrollment information, she will email you a website link so you can get started right away! Once enrolled, you are encouraged to also join a private Facebook group where you can post videos of your practice and receive feedback from Dr. Lemoine herself. At the end of the course, whoever posted a video at least once will be entered to win a WSU School of Music t-shirt!